Christian loves to be outside and loves to be on the move! As he gets older and bigger, we are looking for ways that we can continue to meet his needs for sensory input and a little bit of adventure. 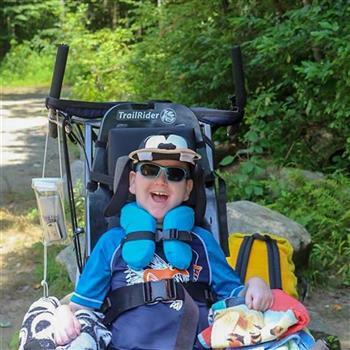 Christian's younger brother loves to ride his bike and we would love to be able to include Christian in this wonderful activity and allow him to engage with his surroundings. Thank you so much! Hope you reach your fundraising goal! So happy to help. Praying for many wonderful family memories to be made! We can’t wait to see more pictures of you enjoying your rides! We hope Christian gets these wheels so he can have many great adventures! We can’t wait to see you riding your new cool bike! I hope Christian gets the bike he needs and has a lot of fun and good exercise with it! Happy Biking from Saugus, MA. You rock Christian. Happy travels on your new vehicle. Let's get you a bike!!! Keep up the exploring Christian! Have a fun ride, Tiffany, Aidan, and Christian ... !!! This is from Paula and I! You are a great mom!! I hope he gets his bike!!! God Bless you All! I can't wait to see that smiling face as Christian rides his new bike. Good luck. A little bit more for Christian! What a great way to spend time as a family! Love to you all. yay Christian! So glad you enjoy being out in nature. Here’s to more trips and lots of fun! Wish I could give more- best of luck! !